Rather than keep updating my New Members thread I figured a build thread would be a more appropriate place to keep track of my changes. Especially as Robb/Mod's went to the trouble of opening up this new section for us. This is my first Lexus, my first hybrid and it's such a joy to drive with plenty of power and it's very slick CVT gearbox. For a big car it goes/stops and handles surprisingly well. The rear boot space was the only concern but with just me and mrsF it's worked out just fine and 6 months down the line we've made a couple of trips over to Belgium without any issues. So lets have a brief recap of the initial 6 months of ownership. Not the best of starts but I was prepared for some work to get an older car 'straight'. Feb 11th, lowered bonnet bump stops that were preventing the bonnet from closing without a really good slam. Updated the OEM satnag, using http://www.latestsatnav.co.uk/ - now the local roads appear. This supplier has the UK/Belgium/etc countries all on a single disk unlike other providers or OEM (over several disks) I needed to disconnect the 12v Battery to get the replacement DVD to load. Feb 14th, dashcam fitted, a Thinkware F770 dual channel that I'd been using in my previous steed. Hardwired into the AUX circuit via a piggy back fuse on the drivers fuse board. Earthed to the forward fuse board bolt. As the fuse board is well recessed, I've left the cover off for the moment but I may cut a slot in later and then refit the cover. Routing the cable was quite easy and only needed the drivers side end of the dash un-clipping. The cable was then tucked in the drivers A pillar and roof lining, up and over to the camera. Excess cable was looped up, cabled tied and tucked under the carpet well out of the way. As the rear sun shade doesn't run parallel to the rear screen (it starts further forward in front of the 3rd brake light) I managed to fit the camera just above the 3rd brake light, higher would have given a better image but that would have interfered with the sun shade. The rear camera cable was run around the parcel shelf, up and over the rear door but I couldn't get a neat run around the top of the b-pillar. So I dipped the cable halfway down the passenger b-pillar, popped off the lower section to loop up the excess cable (out of the way of the seat belt). The cable then went up and over the passenger door and around the top of the screen to the camera. All neat and tidy (ignore the mirror that was just pushed out of the way to show the camera install). Feb 15th, gave the headlights a quick polish to see how they'd come up. Quite pleased how they came our after just a few mins work. Drastic eh. I eventually tracked down the passenger temp control (passenger side) but with the fixing screws out, I couldn't get the servo out :( With fading light I decided to button it all back up and went for a quick test drive. What'd'ya know, the passenger footwell is now working! The only difference is that I taped up the ducting, both sides, to get a good seal from the heater core. Result. The sceptic in me reckons it can't be that easy and that I'll be back under the dash before too long. Which is just as well as I have a few screws left over Never finish up a job in the dark! The passenger side footwell output is still hopeless tho I think I may know which control needs a slight tweak but then it may just be the way the airflows. So rather than dismantle it all again I reckon I'll buy the mrs a heated blanket/mat or fan to keep her feet warm. Yesterday I had the...pleasure? of exploring Leeds city center whilst my car was left at Tony Banks for a new exhaust. To recap the rear section had the usual split and a gaping hole in the OS muffler, so we definitely needed a new rear section. I knew the middle section had a slight blow and when Tony removed the rear...the middle section decided to snap in two! He spent around 6 hours (elapsed) crafting both sections from stainless. The cost of a new center section (with cats) was so tempting that I was already half tempted to get the whole lot done and then I'd never need consider the exhaust again. I didn't want any fancy or annoying noise so chose a standard set-up and driving around town you'd struggle to tell this system from OEM. Under hard acceleration or at dual carriageway/motorway speeds there is a slight increase in noise, which is no bad thing at OEM is really quiet. The system should quieten down a notch once it's coked up a bit. I didn't get back to the work shop before the car came off the ramps so I haven't had a close look at the system but from what I can see it looks dandy. March 17th OSR tyre flat - punctured, replaced with an Avon ZZ5, managed saved the TPMS and fitted a new valve. OSF leaking needed which on investigation then a new TPMS sensor. July 6th, fitted 3M tape and a roof rack before the heavens opened. It'll allow me to get back on the bike and hit some nice trails, once I source a carrier. Excellent write-up. I really enjoyed reading this and your car looks in great condition. I reckon a 450h could well be my next Lexus so I'll be following this with interest. Thanks John, much appreciated. Close up the paint work ain't great in places but considering it's getting on a bit, it ain't too bad. I've had no regrets and everyone that's ridden it, finds it a very nice place to be. It's also nice to be able to easily chat with folks front/back without SHOUTING, unlike many cars. They come with lots of toys too, which is always a bonus. How long have you had your IS 250 F-Sport? Yep, the quietness inside is one of the things I really appreciate about Lexus cars. I've only had this particular car just under a year, Lee, so not looking to change for a while. It's my third Lexus in a row, having been preceded by another IS250 F-Sport, and my first taste of the brand - an IS200 LE which I kept for 4 and a bit years. Sounds like you're a convert then. Any chance of an audio/video of the exhaust mate? I quite fancy a very very subtle exhaust setup, also if you could PM me what he charged you it would be much appreciated. I too quite fancy the GS next however I need more boot space not less the Mrs is already talking about another money burner, think she's got a taste for them now so my bank balance is in trouble, need an estate really but I've really grown very fond of the Lexus feel and drive! I do like the idea of a bigger car such as the GS though just which they made an estate version! Keep the updates coming, any plans for the future? A video, crumbs that's pushing it a bit pal. Will see what I can do but don't hold your breath. The GS isnt like a car in the regular sense, it's more of a limo! Parking spaces are challenging, especially the length. Future upgrades? 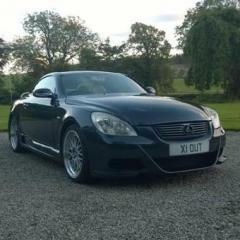 That's a toughie as I chose a Lexus to limit my spanner time so that I can focus on other projects. I have a long time build lurking in the garage... But never say never, right I do like the late grill and may get a few other jobs sorted, stay tuned. Yeah the updated grill modernises the front end I feel its a great look, to be honest it makes the car look "more expensive" as well. Yeah the IS is big enough for me when actually driving not sure I'd be safe anything bigger, but it would be nice to have more space inside sometimes which the GS looks like it has buckets of! Inch or 2 lower and a nice front splitter would bring it to life even more! Oddly the GS doesn't feel like a big car on the move. I think your right about the grill looking more upmarket. Finding one has been tricky but I haven't looked that hard to be honest. Yeah the 4th Gen is a perfect car for me all round apart from the price haha! Yeah well worth keeping your eyes peeled mate I think its a very worthy upgrade. Yeah I bet the GS is a chunk of a car most people wouldn't dare mess! Talking of presence despite the IS not being that bigger car it does get more respect on the road than when I drive my wife's Leon for example, people give way to you a lot more often, and let you out a lot more. Agreed, I was impressed with the quality in an IS I test drove (years back) but the GS does seem to be a notch up. 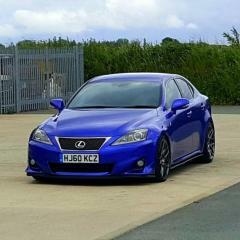 Think I need to take 1 for a test drive, it does have more power than the IS that's for sure but again it has more weight, I wouldn't personally call the IS250 a quick car by any means its not slow but its also not fast. Hehe the more I think about the GS the more I like it, can you see the build thread now "My GS450h estate conversion" haha even I'm not that bold! Maybe it's the Lexus badge that gets respect from most other road users? Our Germanic 'chums' excluded ofcourse! Yeah think you may be right there think they just demand road presence kind of large 4x4's used too but they are so common now think people have become used to a 4x4's presence! Hehe yeah proper family car that would be, its such a shame Lexus don't do at least some sort of estate apart from the old IS200 I would have swapped already if they did, anywho I will stop running your build thread now sorry! @dougie175 we really must arrange a get together. You're welcome to test drive my GS and fold tarmac/time! Yeah would be good to have a meet up, will let you know, not been venturing too far with looking after the little one at the moment! I've not been down there much either, our team is smaller now so no real need. I still get to Mattfest when I can, it's good to catch up with the lads. Yeah it would be good to meet up with some fellow LOC members. I'm going to try and get down to the August meet at the AV8 cafe. Yeah I will try get to something, just everything becomes an epic as its always so far away from Kendal! Good to see a GS450 getting some treatment. When it first appeared I didn't like the new shape but after owning a 430 for a little while it really grew on me. It has a presence, can look posh, can be practical but it's also a bit of a Q car because it's far quicker and more agile than its look and size might suggest. I found it to be quite a driver's car after replacing the rear shocks and fitting a decent set of Yokos. The solution to the slightly smaller boot issue is to go for a GS430 or a GS460 I'm pretty sure that's why I went for the 430. Any plans to change the bodywork? I've seen a few with kits but how good does this look? I don't plan on making any major changes pal.